We install the products that we sell. Northern Strands' installers are trained and certified by the manufacturer. We can look at your existing system – even if we did not install it – and can inspect and recertify it or recommend a solution that better meets your evolving needs. Your end-users will be oriented on using the system so they use it the way it was intended. Safety is the first priority. Northern Strands sends reminders to customers when annual inspections are due. Inspections are conducted by competent personnel under the direction of our engineering department. All inspections are done in compliance with OH&S regulations and CSA standards. Northern Strands can provide you with the rental of some fall protection systems so that you can see what works best for you. Temporary jobs also require fall protection and we can meet those needs on a rental basis. Northern Strands will conduct an assessment of your site. We will identify fall hazards and recommend suitable, cost effective solutions. We can provide you with a custom-designed solution that meets your unique safety needs. It is more than just getting a system installed that complies with the regulations – it is about providing solutions for each customer. 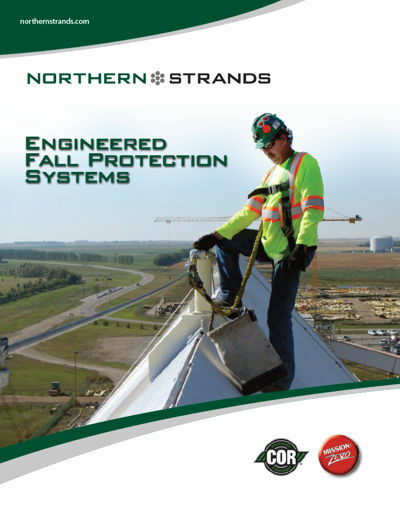 Northern Strands is a leader in the design of engineered fall protection systems. Our team works closely with our clients to design, build and certify fall protection systems that comply with regulations and standards. Northern Strands will design what is required to build a fall protection system that meets safety regulations and that works in your unique environment. All situations and locations that present a fall hazard must be addressed. Northern Strands has had the privilege of addressing a wide variety of customer fall protection needs throughout North America. With a greater understanding and importance being placed on safety in the workplace, the standards and guidelines are everchanging and are becoming more stringent every year. Northern Strands recognizes that these more stringent criteria drastically increase the liability of owners and decision-makers. Therefore, Northern Strands is committed to limiting that liability by providing drawings that have stamps in every province in Canada certifying BOTH the fall protection system AND the structure that the system is attached to. This process sets Northern Strands apart from its competitors and provides peace-of-mind and protection in the unfortunate event of a workplace incident. Part of the certification process includes analyzing the force of falls and ensuring that the solution provided will keep your employees safe.